When you think of Terranea Resort, you probably think of gorgeous views, golfing, swimming, and fine dining…not about bees. But in fact, honeybees at the nearby Catalina View Gardens are busy even as you read this making fine honey that will be used in Terranea’s amazing restaurants. 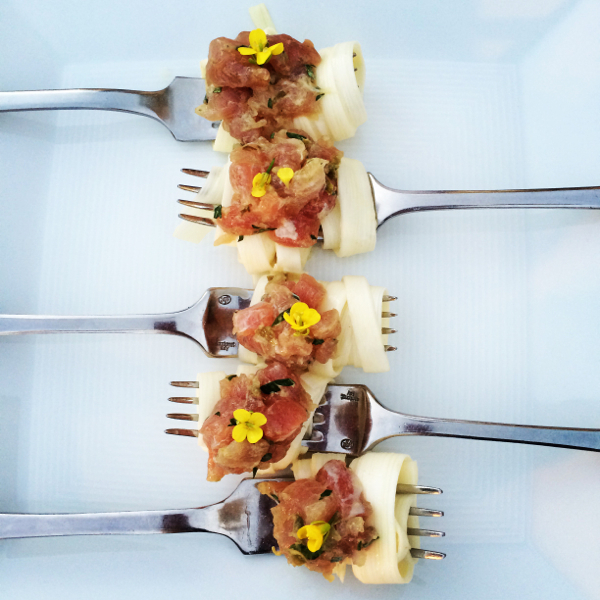 Terranea’s bees were the main focus at a recent “Sweet as Honey” dinner (part of the resort’s Chef’s Cooking Series) highlighting the contributions of bees to fine cuisine as well as the perpetuation of gardens and crops. The dinner fit in with Terranea’s ongoing focus on farm-to-table dining by incorporating produce from its own crops at Catalina View Gardens, as well as local ingredients such as figs from Rolling Hills and pink peppercorns from Ranchos Palos Verdes. 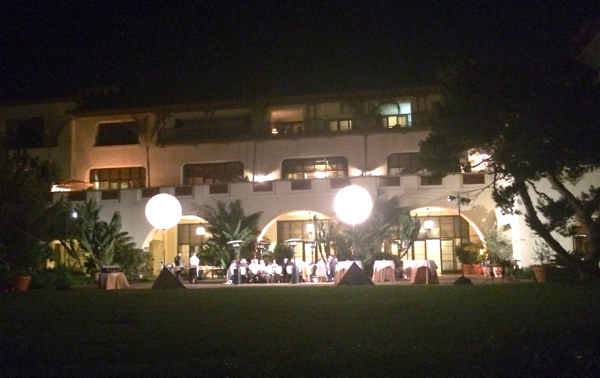 Proceeds from the dinner benefited the California State Beekeepers Association. “The Chef’s Cooking Series is a unique opportunity for us here at Terranea to highlight what we do well in terms of supporting the local community, but also bringing in the learning element and enabling us to grow together and learn new techniques – both the internal culinary team and the guests who attend the event,” says Gaye Vancans, Terranea’s community relations manager. The dinner menu began with hors d’oeuvres prepared by Chef Elie Chow: slow-roasted garden beets with Rancho Palos Verdes pink peppercorn aioli and organic honey; squash blossom fritters with olive tapenade and crispy bee pollen; ahi belly tartare with heart of palm “linguini” and honey-mustard dressing; and jicama-wrapped ishibashi avocado mash with sea salt honey based pancetta lardons. Chef Alessandro Serni then served an appetizer of grilled and smoked local octopus with squid ink aioli, piperade, and peppered honeycomb. 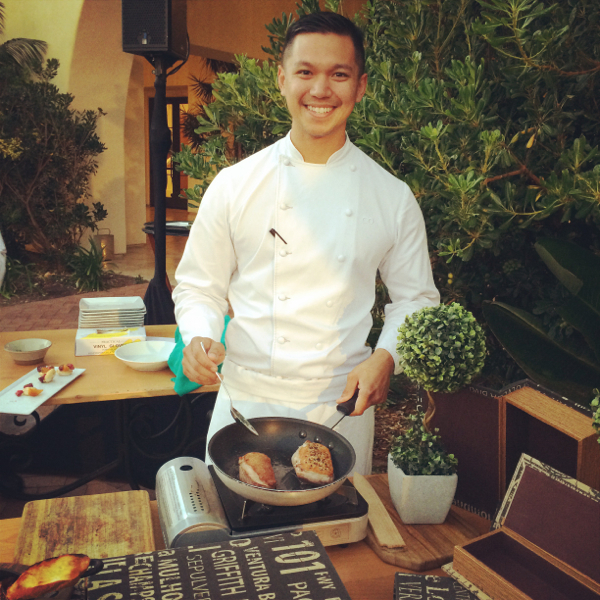 The main course, prepared by Chef Charles Olalia, was a caramelized organic duck breast with Rolling Hills figs in bigarade sauce. Chef Pierino Jermonti wrapped up the meal with a honey-goat cheese lavender mousse with a walnut crisp and poached pears. Tempted by the amazing food as well as the setting? We are too! The next cooking series event at Terranea will be an Autumn Coastal Harvest, benefiting the Pancreatic Cancer Action Network, on November 7. Are you beach-bound for Labor Day weekend? If you head to Seaside Lagoon in Redondo Beach on Saturday, Noosa Yoghurt is going to make it a sweet experience for you and your friends and family! On August 30, between 10 a.m. and 3 p.m., the first 500 people visiting Seaside Lagoon will receive FREE admission at the Portofino Way Turnabout (look for the Noosa flag!). 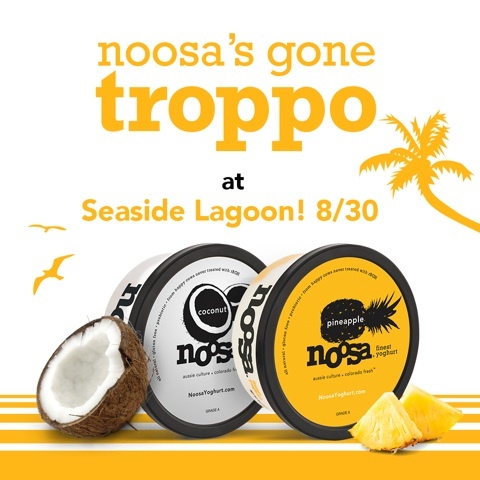 In addition, everyone entering Seaside Lagoon will receive free samples of Noosa’s two new tropical flavors – Coconut and Noosa Pineapple yoghurt – along with classic summer swag such as frisbees, sunglasses, suntan lotion. If you haven’t tried Noosa yet, you’re in for a treat. Noosa is made with whole milk — the freshest you can get – sourced from cows raised and fed (without growth hormones) on family-owned farms in the Colorado foothills. Noosa adds just a touch of honey to give its yoghurt that luscious, tangy taste; and its fruit purees are made from real fruit – no fake stuff in there! Noosa yoghurt is available at Target and other retailers. Head down and tell them South Bay Sparkle sent you! Looking for an adventure out of Los Angeles that’s scenic, educational, and relaxing? Why not skip the traffic jams and try a train trip? 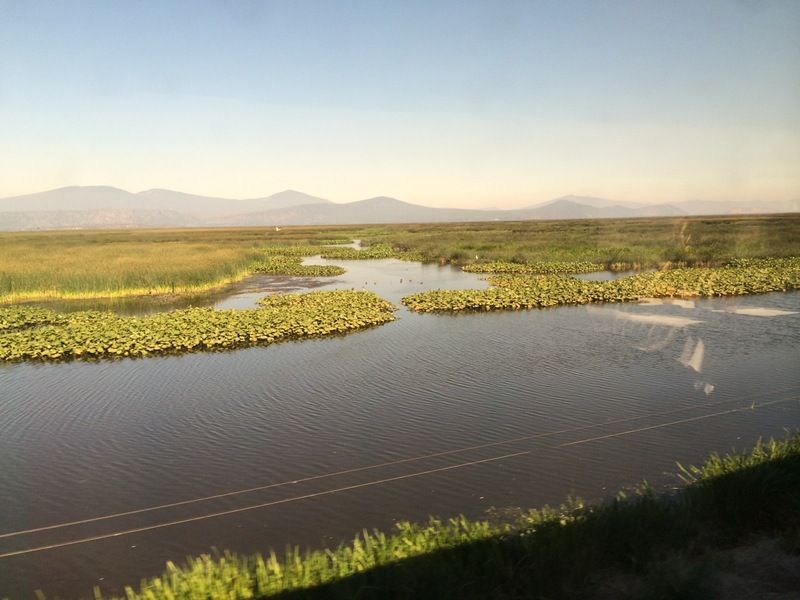 Amtrak’s Coast Starlight train heads right up the California coast and then through Oregon and Washington, ending in Seattle. 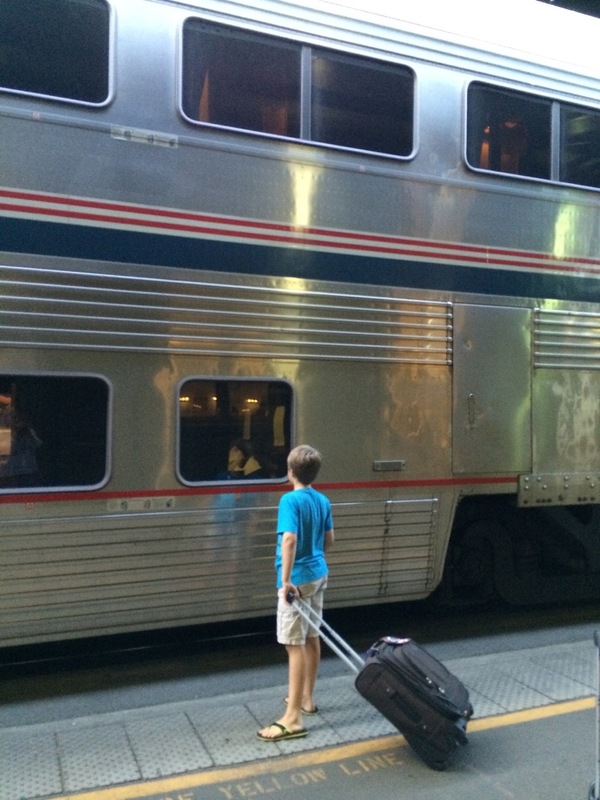 This easy 34-hour journey is spread out over two days and one night, and even by the end of the second day our kids weren’t quite ready to leave the train. As we told more friends about the trip, we discovered that very few of them had ever done it…and they had lots and lots of questions about it, so we thought we’d answer a few of the most frequently asked questions. 1) How was the food? Loved it! When you book a room in a sleeper car, all of the meals on your journey are included. For each meal, you get to choose whether you want to dine in the Pacific Parlour car or the dining car. You book a reservation time, head on over at your appointed time, and then you can order from among several choices on the menu. Our meals were hot, fresh, healthy, and pleasing to both kids and adults. There are several “specials” for every meal, but just to give you an idea, here’s the dining car menu (remember that meals are included if you’re in a sleeper car so you don’t have to worry about the price of each item), the northbound Pacific Parlour menu and the southbound Pacific Parlour menu. 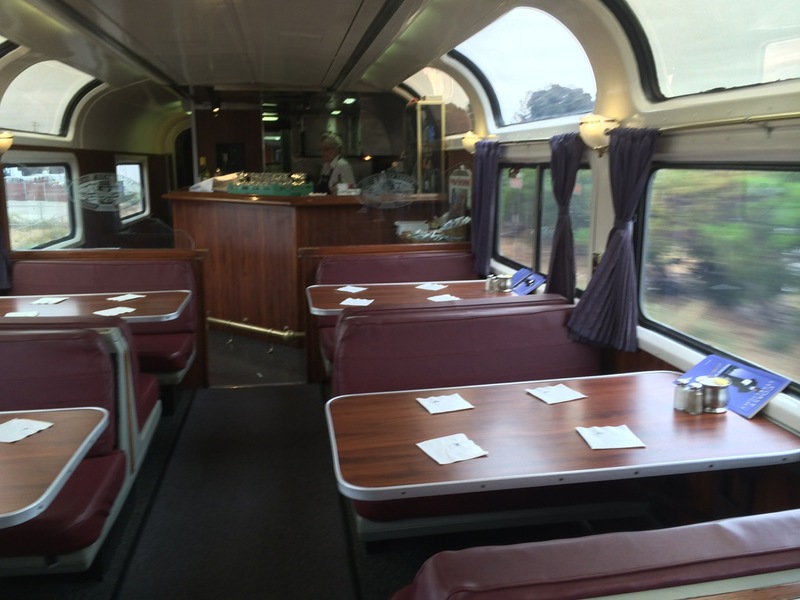 Extra dining car bonus: You get to watch the scenery going by while you eat – it’s better than TV. 2) How was the sleeping? Surprisingly comfortable. Our family sleeping room was designed to sleep four – two adults plus two kids; which means there was an upper and lower adult-sized bunk, and an upper and lower kid-sized bunk. Our group only had one adult and two kids so the older kid (age 10) slept on the upper adult bunk to give him a little more leg room. Had we been a group of four, it might have been a tight squeeze – the kids’ bunks are very compact – but with three people we felt we had more than enough room. In the daytime, we had plenty of room for each kid to sit comfortably by his own window, while an adult could lie down and read a book between them. If you’re looking to stay in a sleeper car, there are several sleeper car room types available depending on the size of your party, including special bedroom suites that have their own bathrooms. 3) How were the bathrooms? The bathrooms are pretty similar to airplane bathrooms – They’re tiny and you may get bounced up and down a little bit while you’re sitting in there. But overall they were clean and well-kept. On our sleeper car there were three separate toilet rooms, plus one shower room, and we never had to wait for the bathrooms. 4) What did you do the whole time? We spent a lot of time either looking at scenery, reading, playing cards, or playing on iPads. 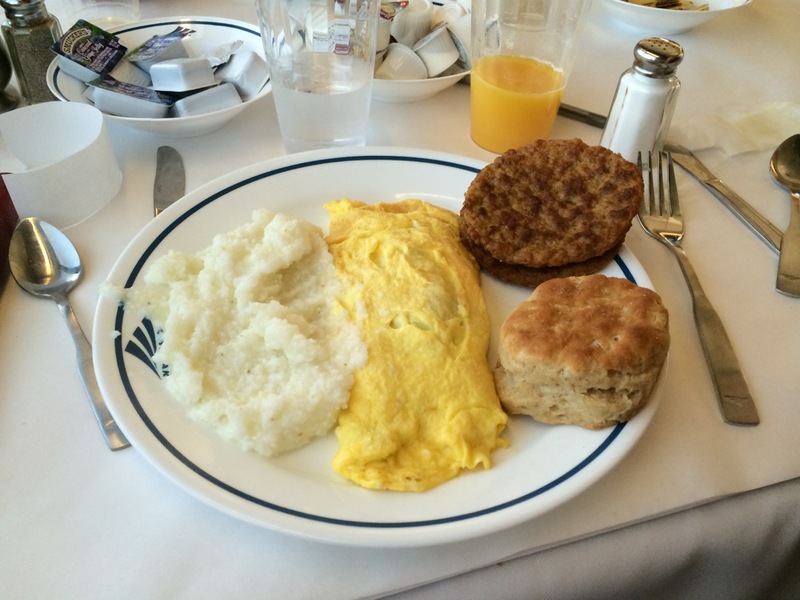 At least three of our waking hours each day were spent in the dining car. 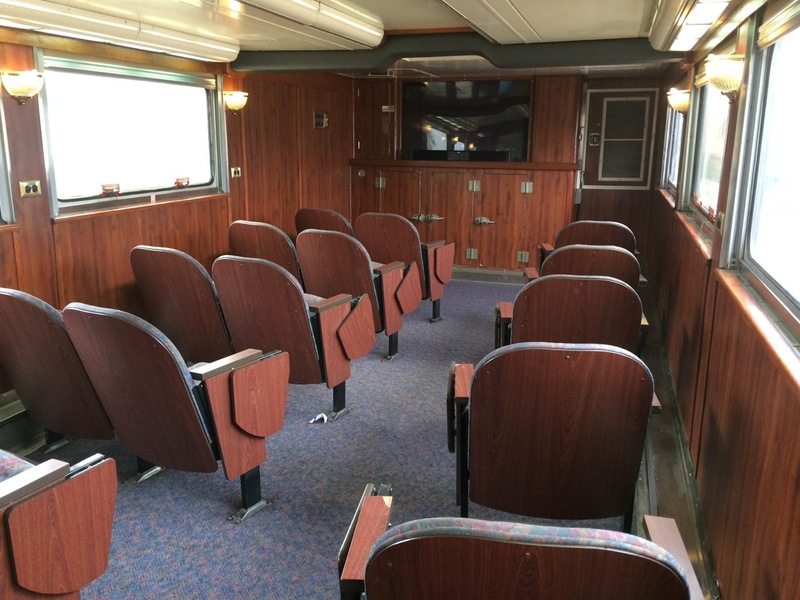 Plus, in the Pacific Parlour car there were movies showing each day (a 3:00 pm kids’ movie and an 8:00 pm adult movie). The observation car also featured a National Park Service docent who gave a talk about the scenery through the Trails and Rails program. The kids had a great time moving from car to car and checking out all of the activities. 5.) Who is available to help you once you’re on the train? Each sleeper car has its own porter, kind of like your own flight attendant, who helps you get oriented and who helps you convert your seats into beds at night. As soon as we got on the train, our friendly porter brought us fresh water and fruit. There’s also an attendant call button in each sleeping compartment if you need assistance. Also, the dining car personnel travel around the train to assist people with breakfast, lunch, and dinner reservations. 6.) What scenery did you see? In the first part of the trip, we enjoyed a lovely view of the Southern California and Central California coastline. Then the train took a “right hand turn” and headed inland through farm country. We reached Oakland at about 10:00 pm when we were going to sleep, so we didn’t see any scenery between the Bay Area and the California-Oregon border. But at breakfast the second morning, we got a chance to see fabulous waterside scenery through Oregon, and the views continued all the way through Washington. 7.) Do you stop and get out during the trip? No, the trip is designed so that you stay on the train the entire time (approximately 10:00 am the first morning, until 8:30 pm the next day). If you need to get out for a quick break (such as a smoke break) you can do that at the bigger stations where there’s a longer stop, but it’s only about 5 to 10 minutes. 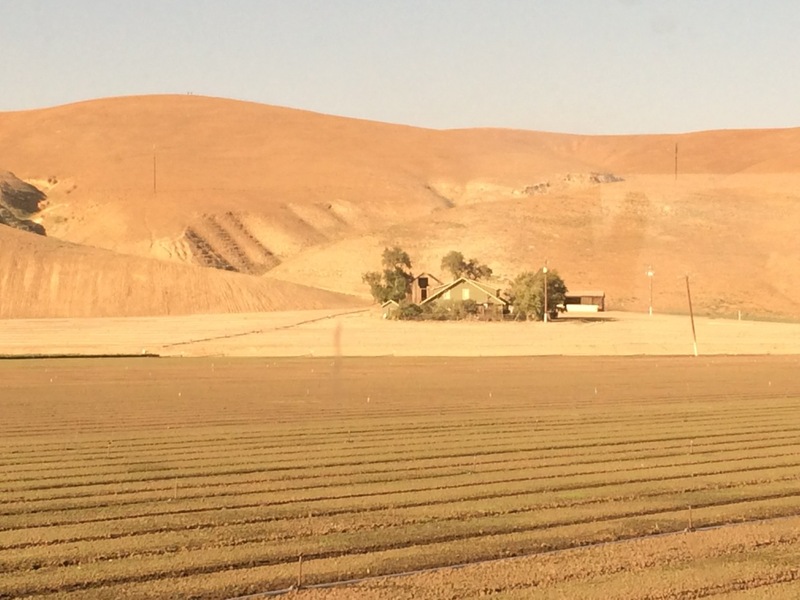 Ideally, you can just rest and relax and let Amtrak do all of the driving. One of the best parts about Hawaii – the fact that there’s so much to do! – is also one of the biggest challenges for a family with limited vacation time. How do you get in all the things you want to do in Hawaii – including relaxing – with only a week to spare? To take on that (admittedly tough) question, our family headed from Manhattan Beach to the Big Island at the end of June. We went there with a list of things that we ideally wanted to do before heading back home, but we resolved not to be so list-driven that it would cost us relaxation time. In short, our goal was balance. Day 1 – Water Fun and Sea Turtles: After arriving in Hawaii at around lunchtime, we shuttled right over to the Fairmont, did our check-in and a quick poolside lunch at the hotel, and then got on our swimsuits and went straight for the water. 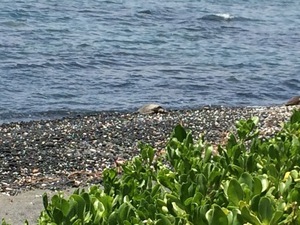 The lagoon at the Fairmont is a favorite resting spot for honu (sea turtles) so you’re sure to see these beautiful creatures swimming and lounging in the sun. (Sea turtles need vacation too, you know). Insider Tip: Spring for the Fun & Sun Activity Pass ($75 per stay for adults; $65 for kids) to get easy access to unlimited pool toys, snorkel gear, paddleboards, kayaks, and more. Day 2 – Hiking and Movies: We woke up early for a bright and breezy hike around the Fairmont property. The beaches surrounding the resort are filled with colorful black lava and white coral, making for a stunning landscape. We took advantage of more swimming, snorkeling, and paddling time in the pool and in the lagoon, then relaxed in the steaming hot tub. That evening, we took in 4D movies at the 4D Adventure Ride theater in the Shops at Mauna Lani. Each movie is 8 to 10 minutes long, and your seat shakes and the wind blows (and you even might get sprayed with water) in time with the movie. The shopping center also features several restaurants, a grocery store, and various clothing and surf shops. Insider Tip: Take advantage of the free shuttle that runs between the Fairmont and the Shops at Mauna Lani every 10 minutes. 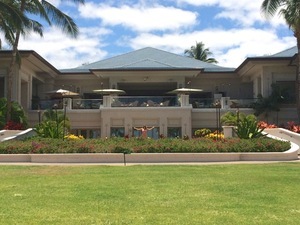 Day 3 – Kayaks and Luau: We started the day with a relaxing breakfast in the Fairmont Gold lounge. Staying on the Gold level entitles you and your family to all sorts of convenient amenities, like a daily continental breakfast, featuring many traditional Hawaiian dishes, afternoon tea time, and early evening canapes and cocktails at the honor bar. The lounge is open all day with access to cold drinks and light snacks, and the friendly concierge is always ready to help. Later we got kayaks for the whole family to paddle around the island. 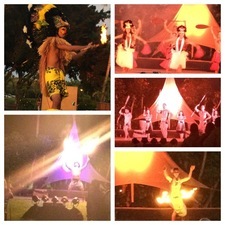 In the evening, we enjoyed the Gathering of the Kings luau on-site at the Fairmont, which provided more than three hours’ worth of food, drinks, entertainment, and crafts for the kids. Insider tip: Get in line early for the best seats at the luau. 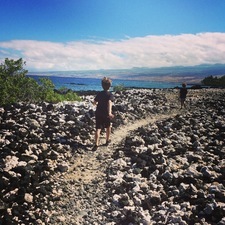 Day 4 – Petroglyphs and Stars: While the grownups relaxed, the kids took a morning petroglyph hike with the Keiki Aloha childrens’ program. The Fairmont is home to one of the largest petroglyph fields in the Hawaiian Islands, and after the kids viewed the petroglyphs, they came back to the kids’ center and recreated their own. In the afternoon, we rented our car and drove to Waimea to the highly regarded Village Burger for lunch, a highlight of the trip from our kids’ perspective. These burgers, made from locally raised cattle, are probably among the best you’ve ever tasted – and the shakes are outstanding. As the sun set, we headed back up the mountain to the top of Mauna Kea for some world-class stargazing. At the Visitor Information Station at 9,300 feet, the nightly stargazing program allows visitors to choose from an array of high-powered telescopes to see once-in-a-lifetime views of the moon, Mars, and more. If conditions are right, you’ll also see part of the Milky Way. Insider Tip: You’ll want to dress warm – really warm – for evenings atop Mauna Kea. The visitors’ center also offers various souvenir jackets, hats, and scarves for sale, as well as coffee, hot chocolate, and soups. Day 5 – Fish and Jet Skis: Hawaii is known for its fresh fish, so we decided to go straight to the source. At Honokohau Harbor in Kailua-Kona, we had front-row seats of the fishing action at Bite Me Fish Market as a sportfishing boat brought in a freshly caught marlin. From there, we headed out to downtown Kailua-Kona to catch up with the folks at Kona Jet Ski. We took a short motorboat ride about a half-mile out to “Adventure Island,” which was the launching point for our jet ski adventure. After jet-skiing, we had a blast jumping on the giant ocean trampoline that floated next to Adventure Island. 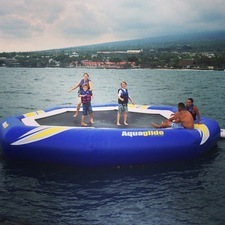 Now we can say we’ve jumped on a trampoline in the middle of the ocean! Insider Tip: Bring your own towels out to Adventure Island so you can dry off, have a drink, and relax after your time in the water. Day 6 – Fishing and Resort Sunset: Back at the resort, we reserved a family fishing trip aboard a double-hulled canoe with our native Hawaiian guide, Ikaika. Ikaika brought along all of the fishing equipment, plus a cooler full of snacks and drinks, and guided us through the fishing process. 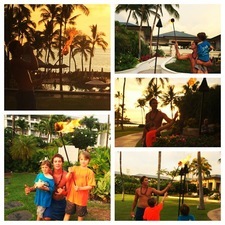 At night, Ikaika was also the Fairmont’s torchlighting ceremony leader, and he led a gaggle of kids across the resort as he blew a conch shell and lit torches across the resort. Insider Tip: Grab one of the lounge chairs by the pool at sunset and you’ll have a front-row seat at the torchlighting ceremony as well as the spectacular sunset. Day 7 – Island Drive, Night Volcano: After checking out of the Fairmont, we headed south through the Kona and continued through lush coffee and chocolate country. 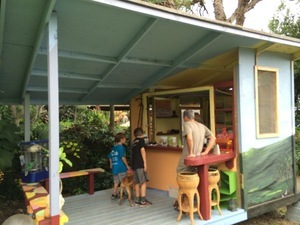 We stopped at Joe’s Nuts, a quirky little macadamia nut farm, where the kids could check out the trees, try their hand at cracking the nuts, and sample different flavors. We continued driving around the island all the way through to Volcanoes National Park, where we had rented a house for the night in the little town of Volcano. Insider Tip: Head into the park at night and stop by the lookout at the Jaggar Museum to see the hot volcano glowing in the dark. Extra bonus for us – we saw a nighttime rainbow, lit by the glow of the volcano, because it had just stopped raining. 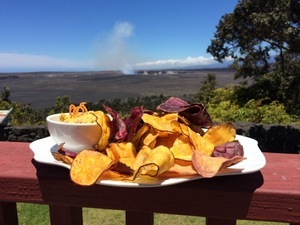 Day 8 – Lava Tube and Farewell Dinner: We went back to the park in the morning, watched a short video at the visitors’ center and enjoyed a delicious meal at the Hawaii Volcano House. Then we headed off on a kid-friendly hike down through the amazing Thurston Lava Tube (you’ll need to be able to walk up and down stairs to get there) and around the rim of the crater. After that we said goodbye to the volcano, headed back around the island, enjoyed a delicious final dinner back in Kona at the Fish Hopper, and then flew home. Insider tip: Take one of the red-eyes back to California so you give yourself a full day for your last day on the island. Aloha, Hawaii! We were so sad to leave – but we were filled up with satisfaction knowing that he had gotten so much in to our eight days in paradise. Summer is here, which means it’s time for beach fun, fruity drinks, and burgers cooked to juicy perfection. At Islands restaurant, you can get all of that and more with their new summer menu…and to celebrate the seasion, we’re doing a special Islands giveaway (Islands beach towel, Islands BBQ kit, and $50 Islands gift certificate) for our readers over at our new site, DigMB. 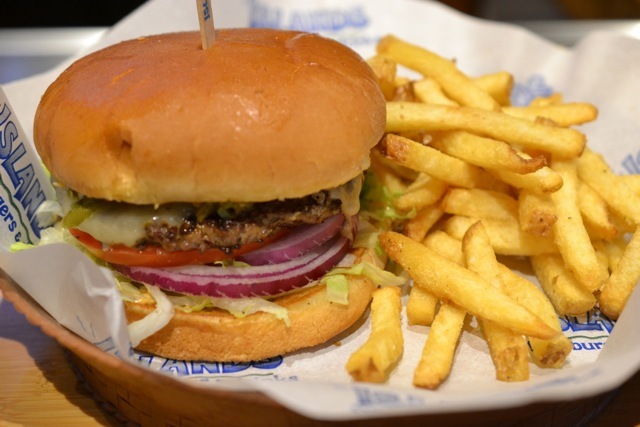 Here’s the summer menu that inspired the giveaway: Islands’ special Heat Wave burger is a sizzling and spicy treat with diced green and serrano chiles, red onion, lettuce, tomato, and pepper jack cheese. 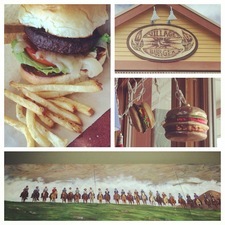 It’s generously sized, and paired with Islands’ bottomless fries, it’ll satisfy any post-surf appetite. Also for happy hour (3 pm to 7 pm), you’ve got plenty to choose from to wash down that burger. This year’s new drinks include Hand-Shaken Strawberry Daiquiri, shaken and poured the old-fashioned way. Other new drinks exclusive to happy hour include the Spicy Mango Shandy made with mango, Coors Light and a dust of cayenne pepper; and the Hapa Bourbon Tea with Maker’s Mark, passion fruit and mint. Looking for something fresh and different? Try the Makaha Maggie, made from Islands’ custom-made grilled pineapple infused tequila, Grand Marnier, lemon and lime juice, fresh crushed pineapple, and agave nectar with a cinnamon sugar rim. If you’re hungry at happy hour, you can also try the new Hawaiian Sliders: mini versions of Islands’ popular pineapple-topped burger. 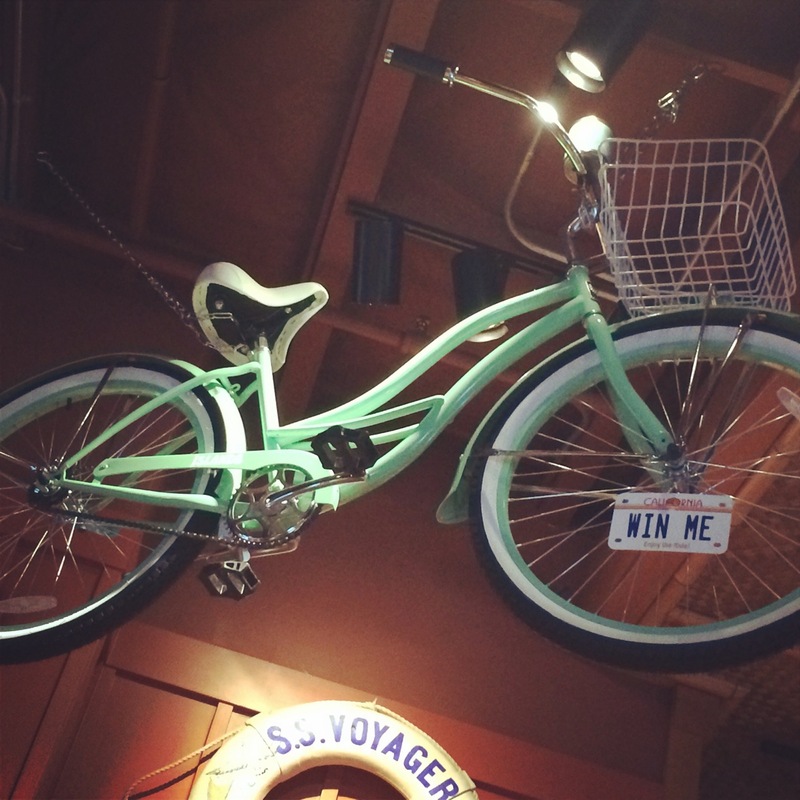 Summer bonus: All summer long, any time you go to an Islands restaurant, you can be entered to win one of these beach cruisers (one per restaurant). The drawing will be held on happy hour at the end of the summer on Friday, September 5. 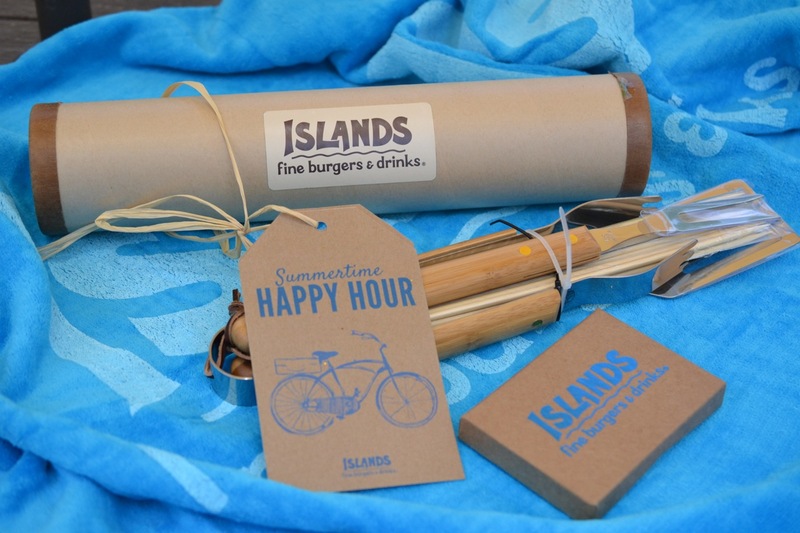 Want to win our Islands gift certificate/BBQ kit/ beach towel giveaway? Head on over to our post at DigMB and fill out the Rafflecopter widget there. Good luck, and enjoy the summer! The Stanley Cup champion L.A. Kings will be parading through the South Bay this Wednesday, June 18. The team has released its official South Bay parade route, from the Redondo Beach Police Department to the base of the Manhattan Beach Pier (corner of Manhattan Ave. and Manhattan Beach Blvd.). It will begin at 3:00 p.m. and is expected to last about 90 minutes. Toyota is providing 15 Toyota Tundras and the Kings will ride in the back of the Toyotas throughout the parade. If you’re in the South Bay on Wednesday, come on out and cheer on your L.A. Kings! He helped you learn how to ride a bike, he bought you your first surfboard, he taught you how to fix a flat tire, and you want to get him…a tie? No, no, no South Bay sons and daughters. There’s a lot more you can do to honor Dad this Father’s Day in the beach cities. 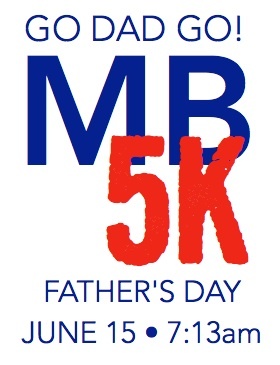 Manhattan Beach 5K – Father’s Day edition: Get Dad out and running on the flat wet sand under the iconic Manhattan Beach Pier. The race starts at the lowest tide point – at 7:13 am on Sunday, June 15. The top five finishers in each of 28 divisions will win one of the race’s World Famous Cookie Medals. Nepotism note: The race is sponsored by our “better half” and all-around great dad – Dave of Manhattan Beach Confidential. Father’s Day Volleyball Tournament: The city of Manhattan Beach is sponsoring a recreational beach volleyball tournament beginning at 9:00 am on the south side of the Manhattan Beach Pier on Sunday, June 15. Fathers, mothers, sons, and daughters are all encouraged to play. Proceeds from the registration fees go to benefit Project Fatherhood. Terranea Team Golf Championship: The Links at Terranea holds its 3rd annual golf championship game on Sunday, June 15, where teams of five compete in an 18-hole event. Prizes, lunch, and music are part of the day’s festivities. The playing format is a five person scramble and teams must use two tee shots for each player. The cost is $80 for Links Card holders and $99 for guests. For more information and to reserve your spot, contact The Golf House at 310.265.2751. Weekend Beer Dinner at Nelson’s: On Saturday and Sunday, June 14 and 15 starting at 5:00 pm both days, Nelson’s Restaurant at Terranea is hosting an outdoor beer event with local breweries featured and gourmet street food pairings. Reservations are required; the cost is $65 per guest. Call 310.265.2702 for reservations. Beer Brunch Cruise: Hornblower Cruises is offering a two-hour Father’s Day Beer Brunch Cruise at noon on Sunday, June 15 featuring a “macho” brunch, free-flowing drinks, and a complimentary souvenir pint glass for dad. The cost is $72 for adults and $43.20 for kids ages 4 to 12 – with additional tax, landing, and service charges. Cookout at the Manhattan Beach Marriott: From 11:00 am to 3:00 pm on Sunday, June 15, there’s no need to fire up the grill: The View restaurant at the Manhattan Beach Marriott is offering a Father’s Day cookout outside on the lawn, featuring a hearty buffet, a “dude food” station, and a craft beer garden serving frosty suds. The cost is $30 for adults $50 with unlimited beer, and $15 for kids 12 and under. Feast at Samba Brazilian Steakhouse: Samba Brazilian Steakhouse is offering an all-you-can-eat Father’s Day Feast on Sunday, June 15 with your choice of 10-12 cuts of meat carved table-side, unlimited sides and salads, and a glass of champagne or beer. The cost is $55 for adults and $20 for kids ages 4 to 10. Prime Rib at Paul Martin’s American Grill, El Segundo: For the whole Father’s Day weekend, Paul Martin’s will be offering a 3-course prime rib dinner special for $25 per person. The special includes all-natural prime rib with mashed potatoes, organic green salad and house-made ice cream. Free Meal for Fathers at Wahoo’s: Fish tacos, anyone? On Father’s Day weekend, June 14 and 15, you can treat Dad to a free meal at Wahoo’s Fish Tacos. Ask the cashier for a Father’s Day flyer. Free Flight at Barsha: On Father’s Day weekend, purchase a wine or beer flight and get a free flight for Dad.